Some budget phones don't show their price. This one does. Prolific budget brand Alcatel showed us a raft of new phones at MWC 2018, with the mid-range represented by the Alcatel 3, Alcatel 3V and Alcatel 3X. All feature an 18:9 aspect ratio screen and a pocket-pleasing price, with the 3X being the most expensive of the three 3s at €179.99 (about $220, £160, AU$280). 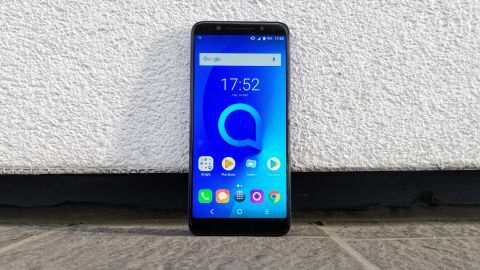 So, if you go for the priciest of the new budget Alcatel handsets (seriously guys, slow down with the kajillion phone releases), what do you get for your money? And would we recommend the Alcatel 3X over similarly-priced budget handsets? Here’s our full review with all the answers. This is a really weird-looking phone. The back panel feels cheap and plasticky, and has 'radial detailing' that reminds us of the grooves on a vinyl record. Those grooves do allow for better grip, but on our Metallic Blue handset, they scream 'cheap'. However, some minor amusement can be had by running a fingernail across the grooves to make DJ-style scratching sound effects. Acting as the center of the ‘radial detailing’ on the back is a circular fingerprint pad, which is a little slower than some we’ve tried but nonetheless works well enough. Above that is an oval dual-camera enclosure and dual-tone flash unit, and below is a relatively subtle Alcatel logo. Flipping back to the front, we have decently small bezels for a budget phone, though the fairly thick bottom one doesn’t have any kind of capacitive buttons, home key or fingerprint sensor – it’s just a black bar. On the rounded right edge is a clicky volume rocker and beneath that, a textured power key. We haven’t had much trouble distinguishing the two by feel while using the phone. The left edge offers the dual-SIM tray (although the 3X is also available in single-SIM configuration in some markets), the top edge houses a 3.5mm headphone jack on the right, and the bottom edge sports two sets of six drilled holes astride an old-style micro USB charging port. Sigh, we still haven’t reached the point where budget phones include the reversible USB-C, then. On the (literally) bright side, the phone includes a 5.7-inch 18:9 ‘FullView’ IPS screen and has a screen-to-body ratio of 78%. The handset doesn’t feel large or weighty when picked up, despite the size of that panel. It can go bright and offers clear, crisp and colorful images from a wide range of viewing angles. The resolution is 720 x 1440 pixels, which equates to about 282 pixels per inch. That’s low, but so’s the price. If display quality is a deal breaker for you, you might prefer to look at the Alcatel 3V and its 1080 x 2160 screen instead. That said, you’re unlikely to notice the lower screen quality in isolation, and we found TV and gaming looked perfectly good as long as you weren’t putting the 3X next to something pricier. Unfortunately, while the screen itself looks good enough, it isn’t especially robust: there’s no Gorilla Glass protection, and we managed to put a pretty decent scratch in the display with less than a week’s daily use. Not ideal.